This page provides general information on what to expect when exploring dungeons. 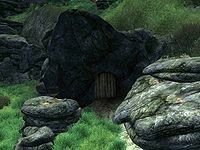 Here, dungeons is being used as a general term to refer to the underground sections of all the various places in the game: Ayleid ruins, forts, caves, and mines. Some of the information is also relevant to any place where you are likely to encounter random creatures and/or loot. The exact creatures/NPCs that you encounter in any dungeon are for the most part randomly generated, based on the current level of your character. NPCs will be set up with a level similar to your character's; the creatures you encounter will become more difficult at higher levels. The process is not completely random, however: each dungeon is defined to have a certain group (or groups) of occupants. Therefore, a dungeon may be identified as being occupied by "monsters". If you enter that dungeon as a low level character, you will probably see mainly imps. If you reenter that dungeon many levels later, it will instead be filled with spriggans and land dreughs. In many dungeons, you will also find one creature a level or two more difficult than the rest. This creature is described as the boss. NPC bosses will generally have special titles to let you know that they're the bosses, and they have slightly better equipment than the run-of-the-mill NPCs. Also, there will generally be a boss chest (described under Loot) somewhere in the vicinity of a boss. Randomly generated enemies will respawn after three days. Enemies respawn at the same time as loot, so the respawning details explained under loot are equally applicable to enemies. However, enemies will respawn more quickly when there are a large number of corpses (more than 15) in a given zone: when the extra corpses are cleaned up, the corresponding enemies will respawn the very next time you re-enter the zone. There are some friendly (or at least non-hostile) NPCs who you can encounter in dungeons, for example the occasional Adventurers. Campsites that may look just like bandit camps may actually be occupied by valuable NPCs, such as Trainers. So it is worth exercising some caution instead of immediately attacking everyone you meet. If in doubt, it's best to get close enough for the game to tell you the NPC's name; if the NPC falls in any of the following enemy categories (or any of the categories listed under enemies at NPCs) go for the kill! This category consists of the "real" animals, i.e., those that you could encounter in some form on earth (albeit sometimes only in much smaller forms than their Tamrielic counterparts). A separate category (Monsters) is devoted to the mythical animals. When you kill most animals, you are able to scavenge some of their body parts. From some animals (wolves, lions, bears) you will retrieve their pelts. From others you will be able to take their meat (mutton, venison, and the always-delectable rat meat), which can be used as an Alchemy ingredient. Rats and mud crabs are nuisance animals that can pop up anywhere: in every dungeon there is a low chance that you will meet one or two of these critters (mud crabs being more likely if there is water around). You may also encounter passive creatures that are generally not hostile. Deer will not attack you without provocation (although you can attack them and harvest venison). Many dogs in the game are friendly (even bandit dogs do not always attack on sight; some will wait until you attack their master and only then attack you). There are also some "animals" in the game that are only present as visual effects. You will at times notice butterflies flitting about; however, these are purely a visual effect and you can not swat them or otherwise interact with them in any way. Bandits are generally fighter-type NPCs, wearing light armor and equipped with a random Blunt weapon. A Bandit Bowman is armed with a bow for ranged attack and a dagger if you come within melee range. Bandit Hedge Wizards and dogs are also considered to be "bandits": at any location populated by bandits, a hedge wizard or dog may randomly appear in place of a bandit. The bosses are identified as "Bandit Ringleaders." See Bandit Dungeons for more details. Conjurers are mage-type NPCs. They do not wear armor, but instead have robes or occasionally magically-enchanted pieces of clothing. When cornered, they will pull out their random weapon (sometimes a magical staff, otherwise daggers seem to be favored by conjurers). Otherwise, they generally summon level-dependent Daedra. Most conjurers will be carrying some potions (especially at higher levels). The boss-level conjurer in a dungeon will be identified as a 'Conjurer Adept'. Conjurer lairs tend to also be populated by Daedra. These are in addition to the Daedra that the conjurers Summon (keeping track of which Daedra are real and which are summoned is critical when fighting these conjurers, because you don't necessarily want to assume that the Xivilai behind you is just going to vanish when the conjurer is dead). Conjurer lairs are the best places to look for alchemy equipment. Almost all conjurer lairs have multiple sets of novice equipment sitting out in the open; in addition, alchemy equipment (of varying quality) will randomly appear in their chests. See Conjurer Dungeons for details. These (along with Dremora) are the inhabitants of all the planes of Oblivion that you will enter. They can be found in Cyrodiil in areas near Oblivion gates. There are also a few dungeons populated with Daedra (in particular Conjurer Dungeons). Dead Daedra can provide you with a number of valuable alchemy ingredients. In many cases, these ingredients are difficult to obtain through other means. Only a few alchemy stores will stock ingredients from Daedra, and their offerings are determined by your character's level. Dremora are the NPC inhabitants of the planes of Oblivion. They are less common in Cyrodiil than Daedra; only a few locations in Cyrodiil have any Dremora. You can often scavenge their weapons, which are of the otherwise unavailable dremora type: they look like daedric and have the same weight as daedric, but do not do as much damage. Their armor cannot be scavenged other than their shields, except for the daedric armor worn by Dremora Valkynaz (encountered starting at level 24). They also frequently carry magical scrolls, potions, and rings. There is a whole goblin subculture in the game: you will encounter many professions of goblins as you explore (e.g. Chefs and Rat Farmers). You will also encounter goblins of several distinct (and rival) tribes. The quest Goblin Trouble provides you with many insights into goblin culture, in particular the importance of Totem Staffs. See Goblin Dungeons for details. Marauders are fighter-type NPCs, similar to bandits except wearing heavy armor and are armed with blades. Marauders are much rarer than bandits (in particular there are very few campsites or surface locations populated by marauders, although they can be found at Fort Blueblood in the Leyawiin Mages Guild recommendation quest). Varieties of Marauders include Marauder Archer and Marauder Battlemage; the boss is a Marauder Warlord. Many of the Marauder lairs are forts. See Marauder Dungeons for details. This category encompasses all of the mythical types of animals encountered in Cyrodiil: imps, trolls, will-o-the-wisps, spriggans, minotaurs, land dreughs, and ogres. Killing monsters will yield various rare alchemy ingredients. Other loot is generally limited, because they tend to carry at most a few gold pieces or a lockpick. However, containers in monster dungeons contain some of the best loot in the game; see Monster Dungeons for details. Necromancers are the second mage-type category of NPCs. As with conjurers, they do not wear armor (preferring robes or enchanted clothing), tend to have a staff or mace as weapon, and typically carry potions. The boss necromancer is identified as a 'Necromancer Adept'. Necromancer lairs tend to also be populated by undead. As with conjurers, these undead are in addition to the ones that the necromancers will summon. 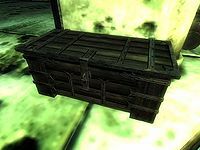 Necromancer lairs are another possible source of alchemy equipment: their chests have random chance of containing alchemy equipment. See Necromancer Dungeons for details. There are three main categories of undead in the game: skeletons (who drop bonemeal), zombies (who drop mort flesh), and ghosts (who drop ectoplasm). At high levels, skeletons are represented by liches and ghosts are represented by wraiths. Some dungeons are specifically populated by skeletons; others will just have a random mixture of any type of undead. It is important to note that ghosts are immune to damage from normal weapons. See Undead Dungeons for details. Vampires are NPCs with randomly selected classes, picking from the full range of default classes. Each vampire will be equipped in a manner appropriate for their class, which can lead to some good loot. In addition, dead vampires yield Vampire Dust. The boss vampire in a dungeon is identified as the 'Vampire Matriarch' or 'Vampire Patriarch'. Vampire lairs tend to also be populated by undead and wolves (both plain wolves and timber wolves). See Vampire Dungeons for details. Generally, most inhabitants of a single cave or ruin will be friendly towards each other (so they team up on the player's character instead of just fighting against each other). This is accomplished by using factions. There are an incredibly large number of factions that exist in the game of Oblivion, but most of them can not be joined by the player. Instead, they are used to categorize all of the creatures and NPCs in the game. Every faction has preset Disposition modifiers towards other factions. Typically, a faction has a +100 modifier towards itself, guaranteeing that all faction members get along with each other. Any other groups that are generally allied with the faction will also have positive modifiers. Some factions have -100 modifiers towards predefined enemy factions. Whenever two characters in the game meet, their disposition towards each other is calculated based on all relevant faction disposition modifiers. If the net disposition is negative, the character will attack. Liches: Allies (+100) with Undead; hate (-100) Necromancers and Vampires. (This faction only includes full Liches, not Nether Liches; Liches are not part of the Undead faction). Undead: Allies (+100) with Liches, Necromancers, and Vampires. There are a wide variety of traps within dungeons. You will only find certain traps in certain dungeons, and these traps will vary depending on the type of dungeon. As with creatures, the exact loot that you will find in any dungeon is for the most part randomly generated, based upon your level. Your level will affect the amount of gold you find and the quality of the equipment you find (including whether or not it is magical). Some loot is non-random. Most of the items that you find out in the open are non-random. Non-random loot is not regenerated. The contents of most chests in dungeons will be refilled after three days (game time), so it is possible to re-visit a dungeon and collect more goodies. The chest contents will be regenerated if you do not enter that area for 72-73 hours (specifically, 72 hours from the next whole hour: if you leave a dungeon at 1:05 pm, the contents will first regenerate at 2 pm three days later). For interior areas, you must leave the zone (i.e., go through a door that triggers the display of a load screen) in order for the containers to respawn. For exterior areas, you must travel at least a couple cells away. If you re-enter the area before three days are over, the clock gets reset. This can be useful if you want to use respawning containers for storage: as long as you make sure to enter the area within three days, items you place in containers will not disappear. Boss chests are slightly larger than normal chests, and are rectangular, as shown in the picture. In ayleid ruins, ayleid casks and reliquaries may be used for boss chests, in which case they are harder to distinguish from the usual-variety chests. Boss chests may or may not be locked. The possible contents of boss chests vary depending upon the ruin's occupants and the type of container, as shown in the following table. This list does not include various less valuable items that can also be found in boss chests (an additional 1-9 gold, regular gems, unenchanted jewelry, repair hammers, alchemy ingredients, lock picks, clothing, or bones, depending upon the chest). All of the contents are leveled, so the best items are only found by high level (22+) characters. #: Number of this type of boss chest that exist in the game. Alchemy Equipment: any piece of Alchemy Equipment. Gold: a large, leveled amount of gold (up to 745 gold possible at level 30). There is often an additional 1-10 gold that is separately added to the chest. Magic Armor: randomly generated enchanted armor (listed at Generic Magic Apparel). "(L)" means that only Light Armor is found in that location; "(H)" means that only Heavy Armor is found. Magic Ring: randomly generated enchanted jewelry (rings, amulets, and necklaces, listed at Generic Magic Apparel). Magic Weapon: randomly generated enchanted weapons (listed at Generic Magic Weapons). Plain Armor: unenchanted armor (listed at Armor). "(G)" indicates that it is a "Goblin" list, in which the best possible quality is Orcish/Mithril. Plain Weapon: unenchanted weapon (listed at Weapons). "(G)" indicates that it is a "Goblin" list, in which the best possible quality is Elven. Scroll: randomly generated scrolls (listed at Scrolls). Skill Book: random Skill Book. Each skill, except Speechcraft, has one book that can be found in random loot. "(C)" means only books from combat skills, "(M)" means only books from magic skills, and "(S)" means only books from stealth skills. Soul Gems: soul gems, both empty and filled. Staff: randomly generated staves (listed at Generic Staves).